Enerdata largely contributed to multiple publications of the Insight_E observatory throughout the year 2015. In partnership with Enerdata experts, several publications have been released, including the Market Stability Reserve: Assessing Reform Needs and Possible Impacts on the EU ETS, the Analysing RES support mechanisms in the EU post-2020, the Shale Gas for Europe study and the Analysis of opportunities and barriers for Mideast gas. This HET assesses the ETS's reform with the introduction of the Market Stability Reserve as of 2019. This new reserve mechanism has a number of aims; namely to restore the EU ETS short-term scarcity by absobing the surplus of allowances, to build resilience to supply-demand imbalances and also to enhance synergies with other climate and energy policies. Current policies in RES-E may transition from providing direct support to renewable technologies to indirect support (e.g. self-consumption at a neighbourhood level). This will serve the dual purpose of alleviating grid balancing issues related to the integration of variable renewables in the grid and promoting distributed renewable installations on the end-user side. Ancillary services such as balancing reserves will need to be priced fairly as the EU moves towards and common internal energy market with varied balancing processes in place in different Member States. One important area for RES-H/C relates to bioenergy that require clear sustainability criteria to ensure that this continues to be an important source of RES post-2020. This Hot Energy Topic (HET3) evaluates the prospects of shale gas exploitation in Europe by bringing together security of supply elements, technology breakthroughs and recent cost and resource estimates for shale gas. The paper assesses what needs to be considered if a full scale development of shale gas in Europe is to be envisaged. It draws from comparative elements with the US experience and from the Polish case, where most drilling has taken place. The Eastern Mediterranean region appeared on the new world gas map with the discovery of the Tamar field in 2009, deemed to promote stability to the region. Since then, new developments have been casting doubt over the opportunity of gas exports from the region. The recent abrupt drop in oil prices and gas prices has delayed LNG projects and oil and gas investments worldwide. Secondly, the ongoing exploration campaign of ENI and Kogas in offshore Cyprus, so far, has not resulted into natural gas discoveries. Last but not least, the evolution towards a more restrictive regulatory framework in Israel may delay Israeli export prospects. Enerdata developped an energy transition data visualization tool for the Insight_E project. 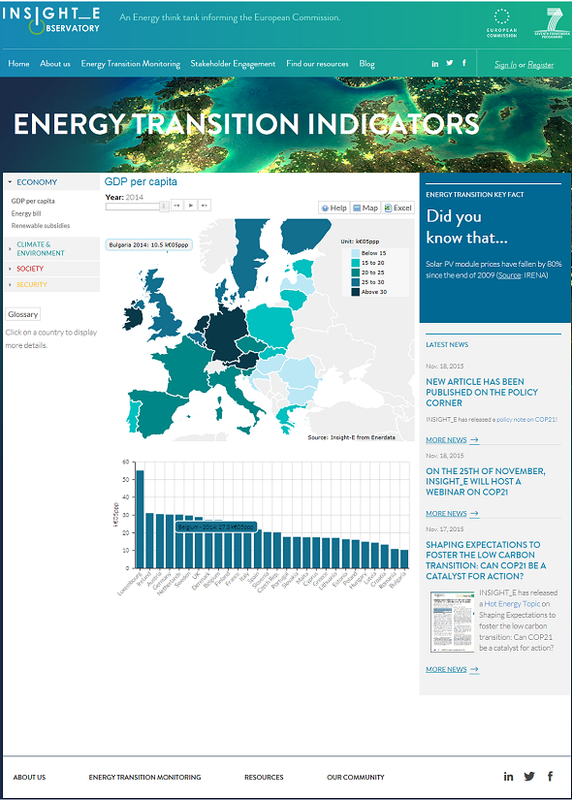 By reviewing energy transition indicators trends in Europe, this web application allows to monitor progress of energy transition over time. Indicators are split in four categories: Economy, Climate and Environment, Society and Security of Supply corresponding to the four pillars of the energy transition. The tool provides indicators for all European countries over the past ten years. Data can be exported to Excel. Insight_E project has recently launched its website, which provides more information about its three year programme of work, a library of recent reports and details regarding engagement opportunities for its ongoing research studies. In July, Enerdata and 11 European partners have launched the Insight_E project, which will serve as the European Commission's energy think tank. The multidisciplinary think tank consists of experts from the energy sector, top researchers, engineers, leading trade, economic, environmental, and legal experts who are experienced in delivering policy advice and impact assessments. It is the aim of the think tank to provide policy makers at the European level with objective and unbiased policy advice as well as insights on policy options, including an assessment of their potential impact. In addition, the think tank will bring to the attention of political decision-makers new trends in technology as well as the objectives and activities of important stakeholders that shape energy policy-making in Europe. In order to assess policy options concerning the four dimensions of sustainability (environmental, economic, social, institutional), the project will use an integrated assessment framework, backed by high-quality data resources available to the project consortium. To complement this, the project will establish innovative methods of stakeholder engagement and trend identification through the establishment of an ‘Energy Observatory’. As a first communications output, the think tank has produced the below newsletter which provides more information about the project, a report on EU natural gas security and an overview of forthcoming activities. INSIGHT_E is a multidisciplinary energy think-tank which provides the European Commission and other energy stakeholders with advice on policy options and assesses their potential impact. The project brochure concisely explains INSIGHT_E's three year programme of work, its partners, principles, thematic scope, outputs, and stakeholder engagement activities. The aim of this paper is to analyse the strengths and weaknesses of the EU energy security of supply, with a specific focus on the gas sector. In particular, the paper provides both a vulnerability assessment of the primary gas imports that could be affected by the continued conflict between Russia and Ukraine, and an overview of legislative tools that could be used to strengthen and diversify the EU's gas supply.